Parker, Colorado, is about 35 minutes from downtown Denver, making it a distant suburb of the Mile High City. After years in Southern California, Brian Ackerman moved his company, Aaudio Imports, here and set up shop in a large custom-built house. It is from Colorado that he distributes some well-known European and Asian brands, including Acapella, Einstein, Lindemann, Raidho, Millennium Audiotrade, Isoclean, and Stage III Concepts. I was here to see and hear "the system," a collection of the very best audio components that Brian represents, and one of the most costly audio systems I've ever heard. But there was much more to discover -- two other complete audio systems, and a power-delivery system that is truly second to none. The lower level of Brian's house -- multiple demonstration rooms and an office -- is devoted to audio and home theater. Brian is pathologically neat; there's a place for everything, and everything is always in its place. As he showed me around his office, his repair area, and his shipping area, I realized that while I'm orderly, he is the Michelangelo of organization. It was when we entered the main demo room that thoughts of what I was seeing turned to what I'd be hearing. This isn't a huge room, 24 1/2"L x 19 1/2"W with a ceiling starts at 8' high and reaches 9', but it has been treated to a fare-thee-well with Golden Acoustics products, which look like armor you'd see bolted to Mad Max's car. There were $40,000 worth of treatments here, each put in place strategically. Indeed, this seemed to be a neutral room -- neither lively nor damped -- a good thing, given that it housed audio systems at each end. We proceeded to another demo room that's at the back of the main room. Here also is the entrance to the bowels of Brian's house, where many of the mechanicals are housed along with the breaker box. When you have as much audio equipment on display as Brian does, you need to have a serious power-delivery system. As with everything else, Brian has gone the extra mile, using a gleaming Isoclean Zero Ohm breaker panel ($4995) that's heavy with copper and gold plating. This works in conjunction with an ATI Tectoniks Ionic Earthing Array grounding system ($4500 including installation) that is like nothing I've seen. It essentially integrates the ground rod -- a three segment copper pipe -- with the soil around it through the release of free ions, making the soil more conductive. The only outward sign of this system is a small-diameter plastic-capped well on the side of Brian's house and near the foundation. 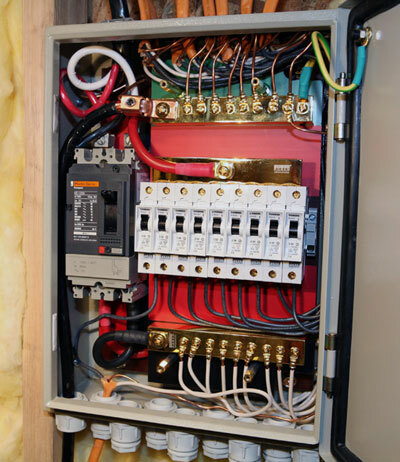 Brian credits both the breaker panel and grounding system with dramatically lowering the noise floor of any equipment he uses. Both are dedicated only to his use; the rest of the house has its own circuits. The pile of demo CD-Rs I had carried with me was making my hand sweat, so, after the protracted show and tell, it was finally time to do some listening. I started in the back room, where NAD Masters Series M3 integrated amp ($2800) and M5 CD/SACD player ($1800) fronted a pair of Raidho X-Baby Mk 2 minimonitors ($6600 per pair), which sat on Sound Anchor speaker stands ($745 per pair). Acapella High LaMusika interconnects ($3300 per meter pair) and speaker cables ($6800 per two-meter pair) connected everything, and Isoclean power products were in liberal use. The smallish room, 12'L x 10 1/2"W x 8'H, was also treated with Golden Acoustics products, though only $3500 worth of them. I've heard the Raidho speakers, which use the company's own ribbon tweeters, at shows, where they generally tend to spotlight the treble, bordering on brightness if not actually reaching that dubious plateau. Here, in this well-treated room that was roughly the size of a second bedroom, the speakers sounded highly articulate and pure without turning nasty. I had the distinct sense that the room was leaving the sound of the speakers and electronics intact, not influencing it to any degree. I listened to a few Gillian Welch cuts -- I find her wistful voice to be a good test of midrange transparency -- and realized that I could have listened here all night, such was the unadulterated resolution of this system and room. Next up was another system fronted by Raidho minimonitors, the one opposite the reference system in Brian's main listening room. This time, the speakers were from the Ayra series, the C1.0s ($13,200 per pair), which rested on some of the most ingenious and sculptural speaker stands I've ever seen. These, called the C1.0 speaker stands ($2900 per pair), are also made by Raidho, and they completely decouple the speakers from the floor while giving them a solid foundation on which to rest. 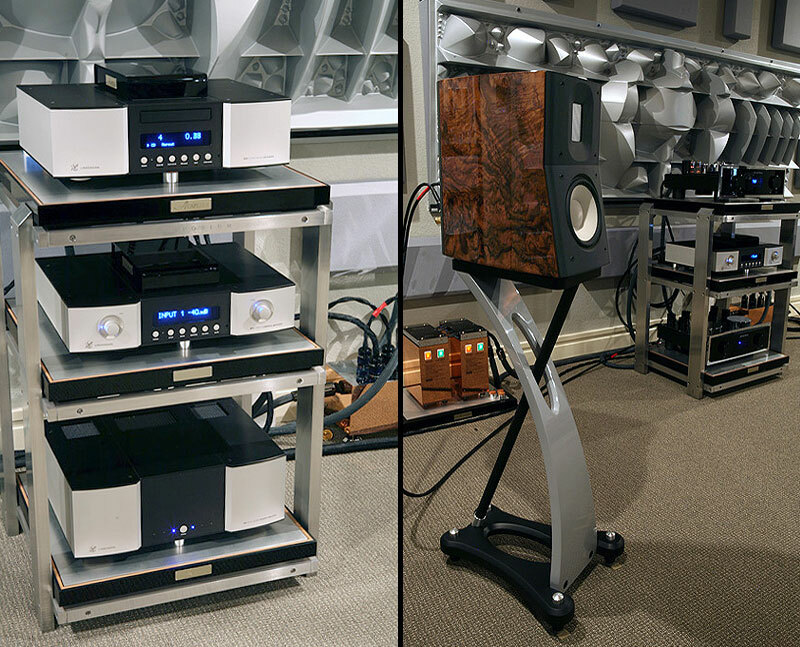 A stack of Lindemann electronics -- 820S CD/SACD player ($21,700), 830 preamp ($13,900) and 855 power amp ($19,000) -- was tethered with Stage III Concepts Gryphon interconnects ($5800 per meter pair), and Acapella High LaMusika speaker cables ($9900 per three-meter pair) connected the speakers. Various Isoclean power products, along with a Symposium rack frame and Acapella equipment platforms, completed this system. Here, the speakers were much farther apart than the smaller X-Baby Mk 2s were in the other room, and they filled in nicely, conjuring an immense soundstage with no holes laterally. Interestingly, the Raidho Ayra C1.0 speakers sounded a bit polite here, displaying some reticence in the lower treble -- that is until Brian swapped in some Stage III Concepts Mantikor speaker cables ($13,200 per two-meter pair), which increased the midrange and treble energy, ameliorating the reticence and bringing this entire system to life. The difference was like night and day, my Gillian Welch cuts sounding bigger and more detailed than they had on the system in the back room. I was so impressed with the Ayra C1.0 speakers that I immediately discussed a review of the larger floorstanding Ayra C3.0s, a pair of which is sitting in my listening room right now. It was time to turn attention to the other end of the room, where the immense Acapella Triolon Excalibur speakers resided. These cost $192,000 per pair and resemble geometric sculptures, due to their multi-piece configuration. A massive woofer column mates with midrange horns and a single ion tweeter, which might be the most refined-sounding high-frequency transducer extant. Driving the speakers were two pairs of Einstein Final Cut Mk 60 mono amps ($32,700 per pair), an output transformerless design that delivers 60 watts. The Acapella speakers are said to be 94dB sensitive and therefore will play to loud levels with as few as 15 watts. They can also be triamped, which Brian has considered, noting only the extra room needed for the amps and the extra heat they'd put out as deterrents. Never mind the nearly $33,000 additional cost! The preamp for such a speaker system is an important choice. It must be low in noise, or the speakers and amplifiers will make the noise's presence known. Luckily, Brian sells the perfect preamp, Einstein's The Tube Mk 2 ($17,400), the initial version of which I reviewed, noting its utter lack of background noise, a trait that Brian's power-delivery system only maximizes. There were analog -- an Oracle Delphi Mk V turntable with SME V tonearm and Einstein TU-3 cartridge ($4700) along with an Einstein The Turntable's Choice balanced phono stage ($9100) -- and digital -- Einstein's The Source CD player ($16,900) -- with Acapella High LaMusika balanced interconnects ($3300 per meter pair) and High LaMusika speaker cables ($9900 per three-meter pair) connecting everything. Power cords were also Acapella High LaMusika ($5500 each), with various Isoclean power-conditioning products and power cords in use, along with Acapella isolation bases and couplers. If you're trying to do the math, I'll save you the effort. All told, this system, including the room treatments and power system, cost over a half-million dollars to assemble. 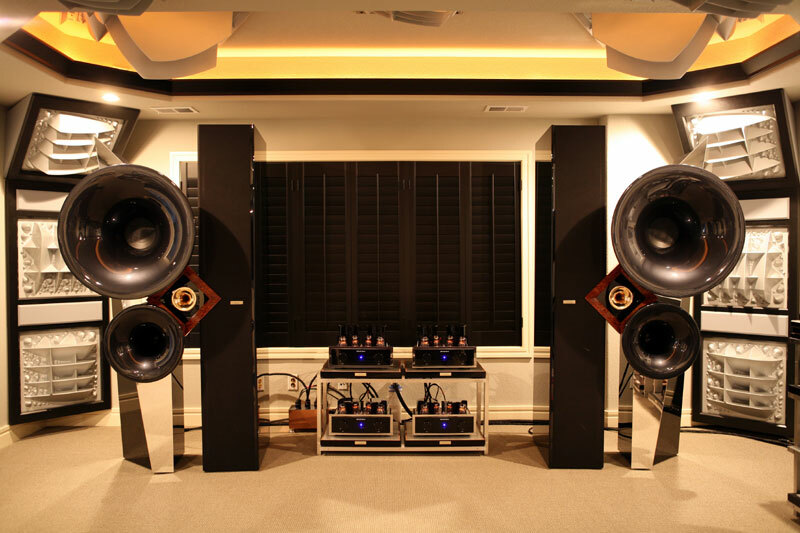 The speakers are big, there is plenty of power on tap, and the room is acutely treated, all of which might lead you to believe in the system's ability to overwhelm, leaving you to utter phrases like "flabbergasted" and "blown away" in the process. Instead, this system sneaks up on you, which is not a euphemism for "it sounds OK" but rather an expression of the unassuming splendor of this combination of speakers, electronics and wires. With female vocal -- again, Gillian Welch -- the Acapella speakers sounded sweet and airy. With something more raucous, like Chris Thomas King's "John Law Burned Down the Liquor Store," their authority kicked in. The bass was well controlled, not overpowering in any way, while the treble was redolent with mellifluous overtones, a kind of resolution as finely drawn as silk thread. I came away from hearing this big, impressive-looking system in awe of its way of conveying emotion. Instead of feeling like the proverbial guy in the Maxell ad blown back by the sheer power of the sound, which could certainly happen here, I leaned into the music, drawn in by the holographic imaging and the refinement of that tweeter. After dutifully playing a number of cuts from my CD-Rs, Brian decided to play something for me. I immediately wondered what he'd pick -- a symphonic masterpiece or perhaps a jazz ensemble recorded with purist techniques, something that would show off his over-the-top system. After of few moments of silence, I heard a voice I recognized. It was Dean Martin! He was singing "I'll Buy That Dream," a cut I'd never heard before. The system adapted, sounding more immediate than it had with my cuts, conveying a chiseled three-dimensional presence along with the treble refinement. This was the last cut I'd hear, and one I'll certainly remember. If you visit Brian to hear "the system," be sure to ask him to play it. Its title nicely sums up what you may be feeling.